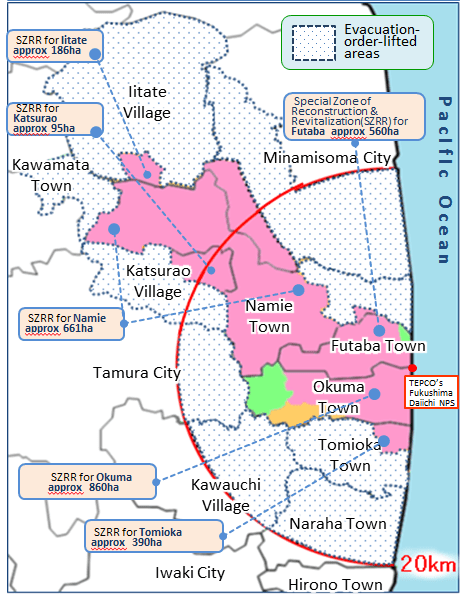 Transition of evacuation designated zones, Government of Fukushima,10 Oct 2018 update. Currently, the evacuation designeted zones (371km2) occupy 2.7% of areas of Fukushima Prefecture (13,783km2). On April 01 2017, most of the evacuation orders issued to the evacution-designated zones (excluding the Difficult-to-Return zones) have been lifted. The Difficult-to-Return zones have beeen recognized in the Plans for Reconstruction and Revitalization for Special Zones. Accordingly, reconstruction and revitalization even in the Difficult-to-Return zones are already showing steady progress with remediation and construction underway. Following the revision of the Act for Special Measures for the Reconstruction and Revitalization of Fukushima (May, 2017), the national government was able to designate special zones for reconstruction and revitalization(SZRR). Plans by the following municipalities were recognized by the national government in the Plans for Reconstruction and Revitalization for Special Zones which stipulated SZRR. The revised act will concentrate on carrying out decontamination and infrastructure development of the designated zones in order to create an environment which people can return to. end quote. source as above. Map presumably showing the remaining “difficult to return to” zones in Fukushima Prefecture. Source as above. It is rational to expect that the catching of game and the collection of food in those areas still described as “difficult to return” is not recommended. It can also be expected that the people who have returned to previously evacuated lands have a diversity of views on the matter. It can also be expected that the people of Japan as a whole possess and should be free to express a diversity of views upon the events since 3/11. Perhaps the last thing the people of Japan need is yet another Englander telling them that their Peaches are massive while she implies that as of today anything grown or caught in the still existing un-remediated zones can be eaten without reference to qualified Japanese scientific advice. For clearly, in reference to food grown and caught in the existing exclusion zones have produced measured degrees of internal cesium contamination in those hunter-gatherer consumers. And that’s a fact. This commonly known and easy to access information was not included in Episode 34 of “60 Minutes”, yet it is critical to know in the context of considering technical information relevant to the Australian nuclear debate. It is also important to know from the perspective of the sociological threads which determine the quality of sophisticated life in the context of a nuclear powered nation. If Australia becomes a nuclear powered nation, have our media barons demonstrated an attitude marked by full disclosure? Or is current affairs in the mass media in Australia today merely the PR tool used at the behest of corporate interests, such as Imperial College London. That specialist centre of British Design and Marketing?